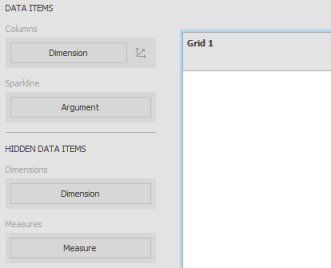 This section describes the features available in the Grid dashboard item, and provides extensive information about data items and how to customize grids. The grid has Columns and Sparkline data sections, which are used to provide data items based on the columns that are created. Sparkline column visualizes the variation of summary values over time. The Grid dashboard item allows you to introduce cell merging and banded rows, and specify the visibility of column headers and grid lines. To do this, use the Design Ribbon tab. The Horizontal Lines and Vertical Lines buttons control grid line visibility. Use the Column Headers button to toggle column header visibility. You can also enable the Grid to merge adjacent cells with identical data. To do this, use the Merge Cells button. The Grid dashboard item supports filtering by rows. When Master Filtering is enabled, an end-user can click a grid row (or multiple rows by holding down the CTRL key) to make other dashboard items only display data related to the selected record(s). To learn how to enable Master Filtering in the Designer, see Master filtering. The built-in drill-down capability allows end-users to change the detail level of data displayed in dashboard items on the fly. To learn more, see Drill-Down. The Grid dashboard item supports drill-down for rows. When drill-down is enabled, an end-user can click a grid row to view the details. Grid - InLoox • Copyright 1999-2019 © InLoox, Inc. All rights reserved.